By early 2013, the International Committee of the Red Cross (ICRC) had compiled an index of 1,000 independent armed groups operating in Syria. These eventually coalesced into five or six major coalitions, but even then Syria’s rebel movement was the most fragmented in a dataset I constructed by a significant margin. Indeed, the Syrian rebel movement is likely the most fragmented in history. What explains this dubious achievement? My research points to a set of social and political policies employed by the Assad regime to control Syrian society in the thirty years prior to the Arab Spring uprising. After the Assad regime crushed a rebellion by Muslim Brotherhood-linked Islamists in 1982, it sought to demobilize both its religious and secular opponents by dismantling the Muslim Brotherhood, coopting potential opponents, infiltrating and splintering opposition groups, and sponsoring small Salafi militant networks. In short, Syrian state policy atomized civil society in the decades prior to 2011. When Syrians rose in rebellion for a second time in 2011, they did so from scattered pockets of opposition, not from a single cross-cutting social base like the Muslim Brotherhood. This, in turn, led to today’s intensely fragmented civil war. The regime employed four policies to inhibit opposition collective action. First, Assad sought to crush the Muslim Brotherhood. Recent research into rebel organizations shows the importance of strong social bases for building unified insurgencies. Between 1979 to 1982, the Muslim Brotherhood served this role in Syria, binding together moderate and radical Islamists in an ill-fated rebellion. After brutally pacifying the Islamists’ revolt at Hama, the Assad regime dismantled the Muslim Brotherhood’s organization root and branch. Law 49 declared membership in the Muslim Brotherhood a crime punishable by death, and the Syrian Muslim Brotherhood, which once boasted tens of thousands of adherents, withered into little more than its exiled leadership. With limited ability to rally Arab Spring revolutionaries around its organization, the Muslim Brotherhood has remained on the outside looking in. Second, Assad sought to bind powerful interests in business and the clergy to the regime, a strategy Syria scholars Bassam Haddad and Ella Wind label “leveling egalitarianism.” Once-rebellious capitalists were co-opted into informal state-business networks; broadly-encompassing business associations languished while personal state connections became necessary for economic success. Similarly, Thomas Pierret’s research shows how Assad relied on “the principle of selection among existing clerical networks: whereas loyal groups were favoured, rebellious ones were marginalised, or destroyed.” While the Muslim Brotherhood had once found mosque-based study groups its most fertile recruiting ground, loyalist clerics received a near-monopoly on religious education after 1982. The regime thus sought to shift the ideological composition of Syrian Islamism towards quietism, to control influential figures within mainstream Islamic networks (and in the process implicate them in the regime’s repression), and to isolate pockets of anti-regime sentiment from one another. Third, the regime co-opted and fragmented radical Islamic networks, both to serve its foreign policy goals and to offer an escape valve for homegrown extremists. The mukhabarat thoroughly infiltrated jihadist networks such as those infamously formed in Saydnaya Prison; they cultivated bought-and-paid Salafist firebrands like imam Abu al-Qa’qa’, and even ran fighter smuggling networks themselves, replete with safe houses funneling jihadists to missions in neighboring Lebanon and Iraq. By crafting extremist networks linked to international pools of foreign fighters, regime policy sowed the seeds of the fragmented, foreign fighter-dominated Islamist component of the Arab Spring insurgency. Civil society in Syria is a wasteland… Contrary to the popular presumption, Syria does not suffer from a shortage of oppositional political parties. In fact, the problem is that there is a glut of these parties, despite the fact that all of them are technically illegal… State agents easily infiltrate parties, foment internal discord, and form breakaway parties with disaffected members. Given this background, it should hardly surprise us that the armed Syrian opposition—even early movers like the Free Syrian Army—were unable to consolidate around a common structure. 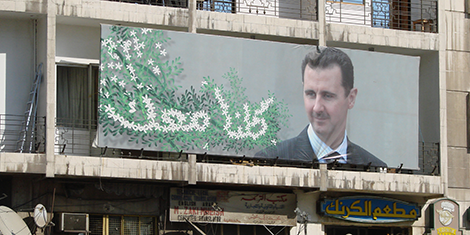 In effect, Assad’s policies had fragmented the opposition well before the Arab Spring rebellion. The same tactics used to control Syria in peacetime helped the regime overcome its opponents in war. Are External Sponsors to Blame? Yet this narrative does not stand up to a close examination of the early months of the Syrian civil war: most early rebel groups self-funded from local sources by looting factories, department stores, and archaeological artifacts, while some resorted to kidnapping and smuggling. Only after battle-lines stabilized and local resources were exhausted—you can’t loot the same factory twice—did rebel groups rely extensively on external resources. By this time, the rebel movement was already dramatically fragmented. Authoritarian leaders learn counterrevolutionary strategy from one another. We can expect beleaguered autocrats like Nicaragua’s Daniel Ortega, Venezuela’s Nicolas Maduro, or Uganda’s Yoweri Museveni to emulate Bashar al-Assad, not only during internal conflicts but prior to them. And as civil wars increase in number, we should expect diverse, fragmented opposition movements to increase as well. Eric Mosinger is a Visiting Assistant Professor of Political Science at Macalester College.